You’ve heard it before. So have the police, the courts and the tenants at Sherman Hills. A tenant or visitor with roots in another town or another state comes to the housing complex and gets in trouble. Maybe it’s drugs, maybe weapons, maybe a fight. Brooklyn, N.Y., native Atrick Taylor lived there at times, court papers say, and came to “visit” at others with drugs in his pockets — despite being banned from the property — before a string of crimes finally landed him in prison. Taylor’s was one of many such cases which have left Wyoming Valley residents asking why problem tenants at Sherman Hills can’t be evicted or have their federal housing aid eliminated when they or guests commit crimes at or near the troubled housing complex? A Times Leader review of U.S. Department of Housing and Urban Development (HUD) reveals agency regulations place the onus on landlords to enforce lease terms, but tenants’ HUD subsidies are off-limits in most cases. According to public disclosures, HUD paid Sherman Hills $1.7 million in 2013 to provide low-income housing at the 344-unit, privately owned property off Coal Street, which is predominately Section 8 housing. At the same time, HUD regulations do give property owners broad discretion over how they can deal with tenants believed to have broken the law, even without a conviction. Whatever measures are taken must be implemented consistently, HUD says, and owners should take into account the severity of any alleged offenses and the overall impact on a community. HUD does not fund apartments, but provides subsidies to individual tenants who live in approved properties. HUD is clear about the terms under which landlords must terminate assistance to a tenant: When there are changes in eligibility or failure to fulfill other program requirements, regarding issues such as immigration status or documenting financial need. Criminal activity generally — as opposed to fraud regarding eligibility requirements — is not cited as a basis for which a landlord must terminate aid. It is possible, in some cases, for tenants whose aid has been terminated to remain in their apartment, subject to paying market or full-contract rent prices. Evicting HUD program tenants, for criminal activities or other reasons, is a separate matter. • Material noncompliance with leases, which include substantial lease violations, fraud, repeated minor violations or nonpayment of rent. • Material failure to carry out obligations under a state or local landlord and tenant act , notably including code violations, such as overcrowding or damage that would make the unit uninhabitable. • Drug abuse and other criminal activity. • “Other good cause,” as defined by state or local laws. This may include conduct for which a tenant was previously given written notice about. Drugs and crime are, of course, the tenant issues which have captured headlines locally, and about which HUD’s regulations — like the above contained in Chapter 8 of its occupancy handbook — go into explicit detail. • Owners may terminate tenancy for any criminal activity by a covered person — which HUD describes as a tenant, household member, guest, or other person under the tenant’s control — that “threatens the health, safety, or right to peaceful enjoyment of the premises by other residents,” or “any criminal activity that threatens the health, safety, or right to peaceful enjoyment of their residences by persons residing in the immediate vicinity of the premises. • Fleeing to avoid prosecution, or custody or confinement after conviction for a crime is grounds for eviction, as is violating a condition of probation or parole imposed under federal or state law. • Eviction actions must be consistent with federal, state, and local civil rights laws, including the fair housing and equal opportunity laws. • Owners must be consistent in use of criminal background checks, the rules state, and clear about the process used to make decisions about when to evict. Lisa A. Wolfe, HUD regional public affairs officer in Philadelphia, discussed issues surrounding background checks in an e-mail to The Times Leader. Owners have the authority to require a criminal background check on current tenants at recertification, Wolfe wrote, “which I understand the Sherman Hills owners instituted,” she added. “Owners who adopt the policy of conducting criminal background checks at recertification must conduct a criminal background check on all tenants at recertification,” Wolfe continued. • Owners also must use care with criminal records, which are to be kept confidential and destroyed three years after tenancy is terminated. 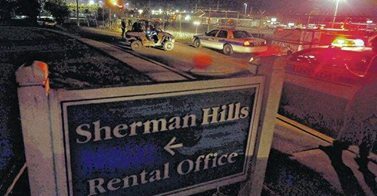 In the wake of rising crime, the 22-acre Sherman Hills complex has come under increasing scrutiny. HUD inspected the complex after two girls were shot in August. Since then, a woman was fatally shot within the complex and there have been drug arrests and robberies. Several of the city’s 13 homicides last year occurred nearby. In response to the inspection, HUD found the apartment complex’s maintenance and operations “unsatisfactory,” citing issues including inoperable surveillance cameras, broken doors and windows and inadequate lighting. And news reports provide numerous examples of individuals living at or visiting Sherman Hills connected with serious crime in the city — although another common factor seems to be that many of those individuals also have out-of-town or out-of-state roots. Many also are repeat offenders. Altrick Taylor’s case, mentioned above, underscores the point. The Times Leader last month reported on the five-to-10-year prison sentence given to Taylor in Luzerne County Court for charges related to drugs, weapons, trespassing and DUI. Taylor, originally from Brooklyn, lived in several places around Luzerne County during a crime spree in 2011 and 2012 that culminated in a drunken car crash in which he rammed a vehicle into the front of a Kidder Street restaurant, injuring patrons inside. He was arrested at least five times during those two years, and pleaded guilty in October. Sherman Hills was one of the addresses listed for Taylor, although he apparently was later banned from the complex. On May 20, 2012, police patrolling building 328 at Sherman Hills recognized Taylor from a previous arrest, noting that he had been previously been banned from the private complex. When taken into custody for trespassing, Taylor was found with a bag containing a white, chalky substance he told police was crack cocaine, according to an affidavit. In addition to prison time and restitution, Judge Tina Polachek Gartley indicated that Taylor may no longer enter Sherman Hills. • Corrective plan: Park Management of Brooklyn, N.Y., which manages Sherman Hills for New York City-based Sherman Hills Realty, submitted a corrective plan to HUD on Dec. 2. The plan has not been released to the public by HUD, with U.S. Rep. Matt Cartwright saying in mid-December that officials were redacting tenant privacy information. He said he was hopeful the remediation plan can be publicly released in a few weeks. The Times Leader has filed a Freedom of Information Act request with HUD to obtain a copy of that plan. Wolfe said last week that HUD is waiting for more information from Sherman Hills before it can be released. • Task force: Federal, state and local officials, including Cartwright, D-Moosic, have joined together in a task force to seek solutions for the troubled property. • Enforcement: Wilkes-Barre city officials have stepped up their enforcement. Last week they shut down an apartment in Building 308, invoking the “one-strike” ordinance, after drugs were found in the unit during investigation into a Dec. 27 shooting. The ordinance took effect on Sept. 1. in an attempt to deal with problem properties where gun and drug crimes are committed. Mayor Tom Leighton said “distribution quantities of marijuana and ecstasy packaged for sale” were found inside the apartment, which now may not be rented for six months. • Enhancements: Sherman Hills management has proposed significant security upgrades, including a gated entrance, fence, armed guard and other steps, and they have hired a security consultant. The owners plan to go before city planning and zoning officials on Jan. 15 seeking approval for their plans. In September, The Times Leader learned that management notified residents of new regulations regarding visitors and parking, and warned that violators could face eviction. As of Oct. 1, visitors 16 and older were required to register with the office regardless of their length of stay and must produce a valid identification to be photocopied. While overall statistics on the total number of HUD recipients to be evicted was not available from the agency, officials with Sherman Hills told city officials last month that they have evicted an estimated 90 people from the 344-unit complex. “We’ve invested a lot of money into having the tenants live like human beings. If we would only be interested in our income, we wouldn’t have gone the extra stretch in evicting any person … that has anything to do with any crime,” Sam Goldberg, regional manager of Sherman Hills apartments, said during a Wilkes-Barre City Council meeting in December.